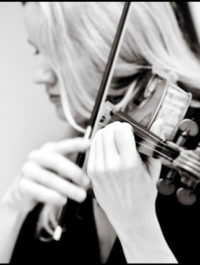 Katharine Gowers has performed throughout Britain and abroad, in recital and as a chamber musician, collaborating with such artists as Alfred Brendel, Imogen Cooper, Steven Isserlis, Pekka Kuusisto, Christian Tetzlaff, Denes Varjon, Lars Vogt. She also has been lucky enough to work with many of the musicians at Resonances. She has appeared at the Schubertiade Schwarzenberg, at the Aldeburgh Proms and at the Edinburgh, Cheltenham, Salzburg, Bath, Lucerne, Delft, City of London, Heimbach, Plush, Spoleto and Resonances festivals. She regularly attends the Open Chamber Music seminar at IMS Prussia Cove. Her concerto appearances have included performances with the Royal Philharmonic, Bournemouth Symphony and Royal Liverpool Philharmonic orchestras, and with the BBC Big Band and the Chicago Jazz Ensemble. For the 2012 Cheltenham Music Festival she guest-curated Time Capsule: 1914-18, a three day series of concerts and associated events focusing on this period. In 2011 she formed a trio with Jonathan Leathwood, guitar, and Chris Hill, jazz double bass. Their repertoire consists of café-style treatments of popular violin works including Kreisler pieces, gypsy tunes, bluegrass, and music from Venezuela, Brazil and Spain. Katharine has been broadcast on BBC Radio 3 and across many other European networks, and has recorded for EMI Classics and Somm. She studied with David Takeno at the Yehudi Menuhin School and at the Guildhall School of Music, with Roland and Almita Vamos at the Oberlin Conservatory in Ohio, with Joey Corpus in New York, and in masterclasses with Denes Zsigmondy in Germany. Last autumn she spent two months in La Paz, Bolivia, teaching at Bolivia Clásica, a non-profit organisation and music school created by Ana-Maria and Armando Vera.